Very clean and nice house. Room is very spacious, furnished with bed, desk (can be unfurnished, your call), and plenty of storage. Bed and desk areas are separated within the room, ideal for people who wants to do some work/ study at home, with a view out to the park. Room was recently renovated with new carpet floor, new paint and new wardrobe. Great sun access with 2 windows on 2 sides of the room meaning you can enjoy both morning and afternoon sun, and that it is cross ventilated with good breeze across the room. 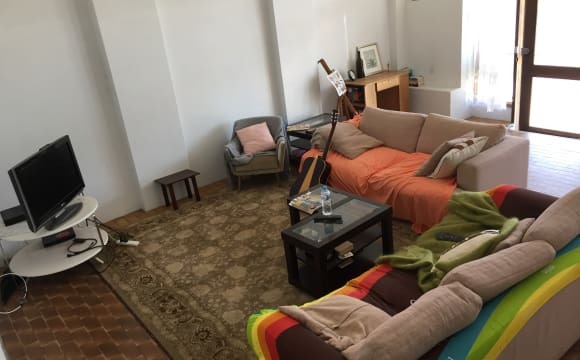 House is 3 bedroom Terrace house with modern renovation. Close to parks, funky Newtown cafes/ restaurants, exciting Enmore Theatre... very vibrant but peaceful neighbourhood. Plenty of buses within 5 mins walk, Newtown railway station is 10mins walk. Close to RPA, and Sydney University... So convenient! Best part is despite the convenience it is close to nature with plenty of parks around... so relaxing! Peaceful garden in the back yard, ideal for alfresco breakfast. There is no parking within the property, but there are plenty of street parking around. Utility (water, gas, electricity, internet) is flat rate $25/ week on top of rent. If committing long term rent can be negotiable. Couples welcome but additional cost applies. Our housemate is going on a round the world trip so we're on the hunt for a new TV and wine companion. We live on a wide, leafy street in Camperdown. 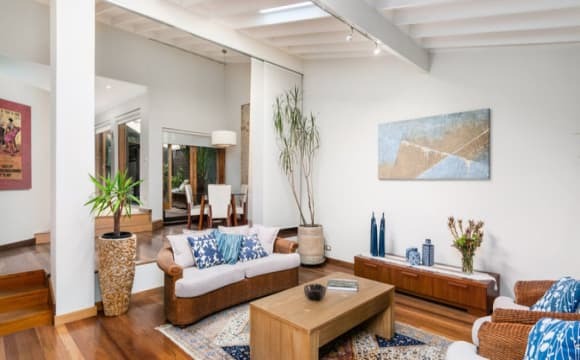 The house has a courtyard-style garden, open and airy dining room, and high-ceilinged living room. The room comes furnished with a queen bed. Our home would suit a young professional who has a sense of humour and enjoys the occasional drink or chat with us. Not pictured: the rice cooker ! Hi beautiful soul(s)! While we're away in Europe for a month, we're happy to rent out our entire apartment which accommodates 4 people. It's a great city location in Sydney, right in between hip Newtown and laid-back Glebe, which should be on everyone's to-see-list. ​ The place comes with a stunning rooftop with Harbour Bridge and Skyline views, a Tennis court, Sauna, Pool, Gym and BBQ area. ​ This place is perfect when you want to be at the heart of vibrant Sydney. With Newtown being only 8 minutes walking distance away it's perfect to explore Sydney's thriving music, theatre, design and restaurant scene. Newtown is a bohemian neighbourhood that bustles with activity day and night. Shoppers head to King Street’s indie bookshops and thrift stores. Hip bars and eateries, as well as, cafes are just around the corner. At the other end, there's Glebe, a 15 min walk away (we looove Glebe so much!! It's our favourite place in Sydney), with its village charm, it's a delight to explore. You’ll find colonial buildings, fine food and wine on Glebe Point Road, the lovingly restored Tramsheds Harold Park and lively markets. Getting around: Public Transportation is 1 min away, with buses going everywhere you want (to the city between 18-30 min; Northern Beaches, Bondi...); also there's a Light Train station in Glebe (15 min walk), as, as well a Train station in Newtown (15 min walk). Only minutes walking distance away from Sydney University &amp; Notre Dam Uni. Supermarket 5 minutes away. Cafe &amp; Dining 1 minute away. Super fast internet in rent included. Pool, Sauna, Tennis Court ​in rent included. Fully equipped kitchen, towels, shampoo, linen and and and provided. Shoot me a message if you have further questions. 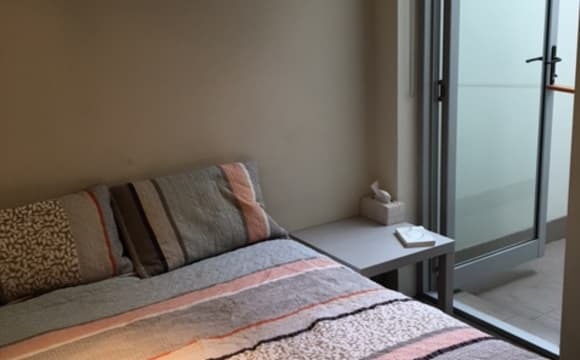 Massive private bedroom available now, so close to the city, you can walk there in 10 minutes! This modern apartment block located on Larkin Street is quiet and tucked away and yet easily the most convenient location in Sydney. Fully furnished with everything you need and including a car space, air conditioning, balcony and indoor dining area. All you need is to bring your luggage and stay with us! Your spacious private bedroom comes with sleeping area and chill out zone. You will have plenty of storage space under the queen size bed and a walk-in closet. Perfect location: Bus stop is literally up the street, girt by Parramatta Road, where buses to the city run every 5 minutes and some buses even going to Bondi Junction; and crossing the road, buses heading west, as well as Sydney University Camperdown Campus and Royal Prince Alfred Hospital is a 5 minute walk away, and Broadway Shopping Centre is 10 minutes away by foot and less than 5 minutes by car. Plenty of cafes and restaurants around you and it'll only take you less than 15 minutes walk to the central of CBD. These rooms won't last long so please call to book an inspection asap to make sure you get a five star accommodation. The house is a great three level terrace style executive apartment in Camperdown, a stone's throw away from Sydney University, RPA and all the action of King Street in Newtown. 10 minute walk from Newtown Station. 5 mins walk from Parramatta Rd buses. Some other highlights include: - High ceilings - Reverse cycle air-conditioning - Dishwasher - Washing machine - Two balconies (including private rooftop terrace) - Polished blackbutt wooden floors - Bright and airy - Secure intercom - Privacy (lots of separation between living area and bedrooms) - Separate WC downstairs - Modern kitchen Pictures are a little old but property still in good condition. Bonus if you have some of your own furniture! Bedroom can come furnished if you would like to buy what's in there from the vacating room mate. Spacious modern apartment conveniently located to have everything at your fingertips. The vibrant cultural hub of Newtown is well within walking distance, offering a never ending selection of culinary and nightlife options, while brunching couldn't be any easier with trendy cafes right on your doorstep. Your room itself is spacious, homely and comes with your own separate bathroom. permanent underground parking is available but not included, it can be negotiated if required. additional underground visitors parking is also available. no smokers or pets. Up for rent is a furnished room with single bed, study desk, air-conditioning and ensuite bathroom. The apartment is sun-filled and spacious, equipped with modern appliances, washing machine and air-conditioning. Includes open plan kitchen with gas cooking, generous indoor living space and large courtyard. 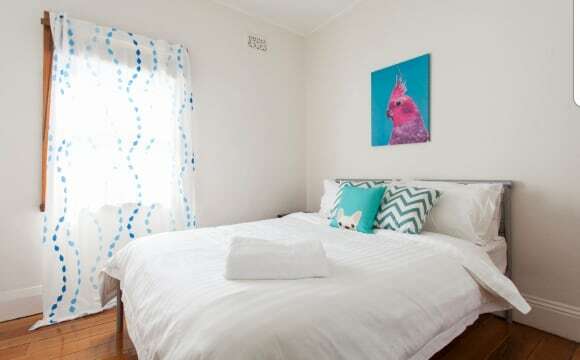 Less than a 10 minute walk to RPA, USYD and Newtown, 2 minute walk to CBD bus. 12 minute walk to Newtown Station. Utilities including internet, gas and electricity are on top of rent. Internet and gas are $10/week fixed. Electricity is shared upon bills. The current bill is $7/week approx. *SHORT TERM SUBLET. I'm travelling overseas for 2 weeks, therefore subletting my room to anyone who needs it from the 1st of May to the 14th of May. Conveniently located in the heart of Camperdown, you'll be living next to The University of Sydney, the RPA Hospital and a few minutes away from the Broadway Shopping Centre. The flat is fully furnished, you'll have all the amenities including air-conditioning, washing machine, dishwasher, dryer, and unlimited internet access. The room comes fully furnished with a queen size bed, a desk and built in wardrobes. You also have a nice, spacious private balcony with a view. The room is oversized compared to others in the area. The flat has wooden floors throughout which works best to keep the temperature cool during summer or winter, very easy to clean. The apartment is still fairly new, built over 4 years ago. The price is $360 per week all bills inclusive. Bond will be 2 weeks rent. The room is available between the 1st of May and the 13 of May ONLY. I have a spacious double room in Camperdown (all bills included) and is ready to move in straight away. LOCATION - 10 minutes walk to King Street, Newtown and 3 minutes walk to Parramatta Road for access into the city. - Moments away from RPA hospital. 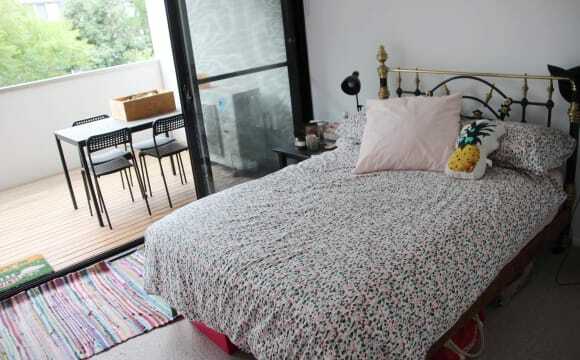 - Close to the university, city, parks, bars, cafes and restaurants in Newtown. THE HOUSE - 4 Bedrooms and 2 Bathrooms. - Furnished throughout with a fully equipped kitchen. - Outdoor area. - Laundry facilities. - Culture of the house will be clean and tidy. - Regular Professional cleaner. WHAT DO YOU GET? - Your own private double room - Fully furnished with a Queen Sized bed - Free unlimited WIFI - All bills included in rent (Internet, water and electricity) TERMS - Singles/Couples - $350/$400 - 4 weeks Bond + 2 weeks rent in advance. All bills are included in your weekly rent. This 3 bedroom unit right on the border of thriving Newtown is ideal for anyone looking for a bit of change. The first floor has a shared living space and kitchen, a metal spiral staircase takes you up to the 2nd floor which holds 2 bedrooms and a shared bathroom. The 3rd floor has a larger room (taken) with a balcony and en-suit. This unit is only 10 minutes walk to Newtown station and only 5 minutes to Parramatta road. Surrounded by cafes and bars all barely a stones throw from the front door. It is also only an 8 minute walk to SYDNEY UNI! The $260 in rent includes ALL bills and also a fortnightly cleaner that polishes the common areas. We are looking for someone for a minimum stay of 6 months, must be LGBTQI+ friendly, clean and employed. Unfortunately we cannot allow pets due to our landlords rules and smoking is not preferable but negotiable. We are not much of a party house but you are more than welcome to have friends over whenever you want, of course.